The disposable razor might look like a simple piece of plastic with a hoe-shaped blade attached to it. However, the safety razor has had a long history of changes that helped to make it more popular than the straight razor. Some people would claim that the development of the safety razor began with King Camp Gilette’s invention of his safety razor. However, the first big change from a straight razor to a safety razor actually took place in the 18th century, from a French designer. This designer, Jean-Jacques Perret, crafted a wooden guard that fits over the razor like a sleeve. This guard only allowed for a small portion of the blade to protrude, keeping the blade from seriously injuring the skin. By the time other inventors passed the design over to America, they had implemented a comb guard in 1847 to prevent the blade from cutting deeply into the skin. After 33 years, Frederick and Otto Kampfe invented the Star Safety Razor in 1880. This razor was literally shaped like a hoe, with the blade protruding at a perpendicular angle to the skin. Although this was a major improvement that made shaving safer than ever before, it was still dangerous. The blade could still dig into the skin, because of the nasty way it scraped along the skin at a 90 degree angle. People also had to constantly sharpen the blade. Thankfully, King Camp Gillette came up with a better solution in his patented Gillette safety razor in 1895. Gillette decided to develop a razor with a small, disposable blade. Although the blade design was similar to the Star Safety razor, the blade was more inexpensive. Its compact size made it much easier to use. As one could imagine, this $5 razor became an extraordinary tool for men to shave off their facial hair. 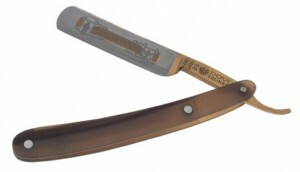 The design progressed even further when Col. Jacob Schick invented the magazine repeating razor in 1926. Rather than implement a comb guard and blade, he simplified the design to a thin, single blade protruding only slightly from a hoe-shaped handle. Technically, this was the biggest revolution that cemented the shaver as an important staple in men’s hygiene. At first glance, the only difference between a man’s razor and a woman’s is the color. One is pink and the other isn’t. However, there are a few details in the shaver design that distinguish the two apart. The biggest difference is in the blade’s shave angle. The blade of a man’s razor has a sharper angle when it makes contact with the skin. This makes the blade much more effective at cutting tough hairs aggressively. Women’s razors also tend to have a slight arc in the head of the razor. Women often need to have a clear look over the head, to see how the razor is shaving their legs while they are sitting down. There are also razors with combs, if women have sections with long hair to shave off. Although all these little design tidbits may seem like no big deal, they are very crucial in determining the overall performance of a shaver. People shouldn’t assume that a razor is just a cheap piece of plastic. Shavers take much more time and effort to design than a person might think.